But UK experts urge caution, saying other studies have shown no clear link between red meat and breast cancer. Past research has shown that eating a lot of red and processed meat probably increases the risk of bowel cancer. The new data comes from a US study tracking the health of 89,000 women aged 24 to 43. A team, led by Harvard School of Public Health in Boston, analysed the diets of almost 3,000 women who developed breast cancer. "Higher red meat intake in early adulthood may be a risk factor for breast cancer," they report in the British Medical Journal. "And replacing red meat with a combination of legumes, poultry, nuts and fish may reduce the risk of breast cancer." Dr Maryam Farvid and colleagues described the risk as "small". Prof Tim Key, an epidemiologist at the University of Oxford, said the US study found "only a weak link" between eating red meat and breast cancer, which was "not strong enough to change the existing evidence that has found no definite link between the two". "Women can reduce their risk of breast cancer by maintaining a healthy weight, drinking less alcohol and being physically active, and it's not a bad idea to swap some red meat - which is linked to bowel cancer - for white meat, beans or fish," he added. Prof Valerie Beral, director of the Cancer Epidemiology Unit at the University of Oxford, said dozens of studies had looked at breast cancer risk associated with diet. "The totality of the available evidence indicates that red meat consumption has little or no effect on breast cancer risk, so results from a single study cannot be considered in isolation," she said. Sally Greenbrook of Breakthrough Breast Cancer said the charity would welcome more research into the impact of red meat on breast cancer risk. "It's already been proven that women can reduce their breast cancer risk by maintaining a healthy weight, reducing alcohol consumption and increasing the amount of physical activity they do," she said. Jackie Harris, a clinical nurse specialist at Breast Cancer Care, said: "This study is interesting because it looks at young women's eating habits and supports the growing body of evidence of the importance of eating a well balanced diet. "Doing exercise and keeping a healthy body weight can also help reduce your risk of breast cancer. "However it is important to remember that it can't prevent it completely. "Being female, increasing age and having a significant family history are the three main risk factors for developing breast cancer." 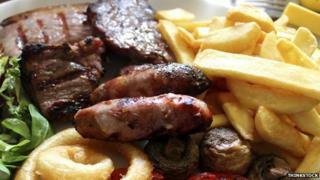 Evidence has shown that there is probably a link between eating lots of red and processed meat, and the risk of bowel cancer. Guidelines from the American Cancer Society also suggest limiting how much processed and red meat are consumed. Meanwhile, a separate study found that women with large numbers of moles on their skin may be at higher risk of breast cancer. "It's not yet clear how useful asking women to report how many moles they have as part of risk estimation would be, given that there are several other, more reliable, risk factors at play such as weight, age, and genes," said Dr Matthew Lam of Breakthrough Breast Cancer.